Being a parent makes you a pro at multi-tasking. Be it diaper change or sudden cries of hunger, you are always prepared to handle it all. 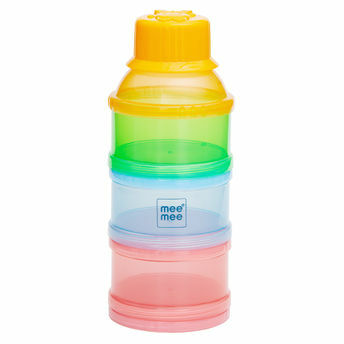 Mee Mee Multi Storage Milk Powder & Food Container is a must-have if you want to handle such baby crises with panache. These multicoloured containers make it easier for you to carry a variety of baby foods such as semi-solids, milk powder, purees, mashed fruits etc that would suit your baby's different moods, while on the go. Easy to change the combination of containers depending on your needs.